One of my favorite craft shows, organized by the awesomely rad Andrea & Rob (of Lotus Events), is going bite sized! 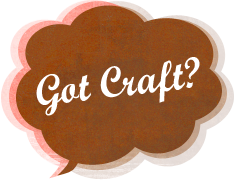 Instead of the twice a year goodness of the largest indie craft fair in Vancouver, this Sunday, August 9th, there will be a mini version of Got Craft with a smaller selection of vendors, an outdoor venue &…drumroll…me! UPDATE: the monthly Got Craft shows have been officially canceled. Sorry to disappoint!